INPUT CHARGE CONTROL: This control determines the amount of charge taken in by by the heater, which in turn determines the temperature of the heater`s storage core. The higher the charge, the higher the core temperature. ROOM TEMPERATURE BOOST: This is dependant upon the amount of charge taken in by the heater. This control allows extra warmth to be released by means of a damper that is opend to allow a greater air flow through the heater`s core. CONVECTOR: The convector may be used independently of the storage heater to, for example, top of the current heat level on very cold days. THMERMOSTAT: Adjustable rotary dial allowing temperature ranges from 5°C to 35°C. Bi-metallic strip. Selection variable from early to late or zero boost. 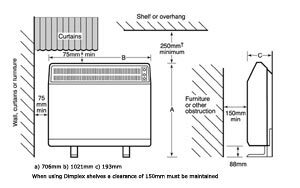 The CXL Combination Storage Heater is the largest of the range with an input rating of 3.4kW. Provides a continuous source of warmth, primarily from cheap off peak electricity. 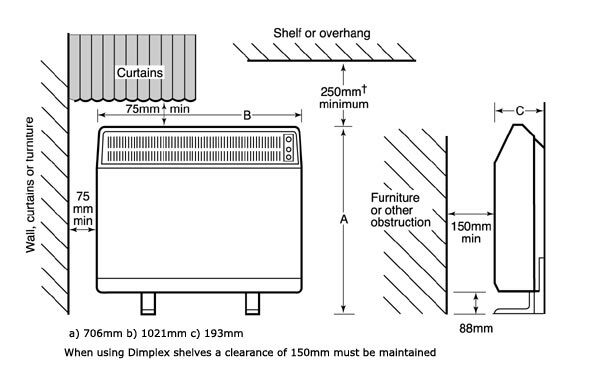 Convector elements give completely silent top up heating. Convector thermostat can be set to maintain constant room temperatures and automatically switch on as necessary. Storage heater controls and components based on the market leading XL range includes reliable manual input control and room temperature boost to make optimum use of the heat stored. Conveniently positioned convector controls on the front panel. Lower convector loadings selectable by installer. For stability and safety heater must be supported on the feet provided and securely fixed to a wall. Located at front right hand end of base -accessible by removal of front panel assembly. Hidden cable support straps at rear of heater allow neat supply cable connection from either side of heater. Galvanised finish sheet steel base, mounted on steel feet, supporting double skin front and outer panels. One piece front panel/grille assembly and front inner skin remove for brick loading. Remove front panel assembly then front inner skin. Remove internal packing containing elements, position rear layer of bricks, heating elements and front layer of bricks.